I want to un-mystify the confusion behind hair levels & the difference between professional color and Everything else. 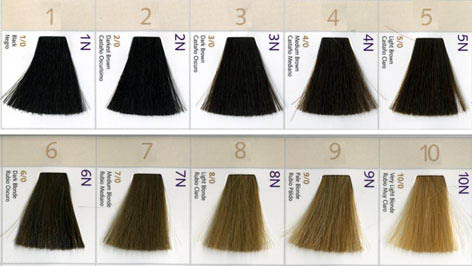 In the Hair coloring world there are 10 levels. The darkest level is a 1 & 10 is the lightest. Everything in between is progressively lighter from 1 up, so a “5” is a medium brown. Often times you will hear stylists discussing a “7”, or tone with a “9” and then a Letter, such as “A” or “N”. Those letters indicate the tone of the color. I have a lot of people say, “I use Sally’s color, so that is professional”. Unfortunately, it’s not. The only color that is professional is one that can be bought by a licensed cosmetologist. The molecules in hair color bought from both the grocery store box color and Sally’s are VERY large an almost impossible to pull out of the hair and severely damage the hair. Professional color is small and can be easily removed or changed. Salon purchased shampoo and conditioner is very important to maintain your color because it will maintain the vibrancy and integrity of the hair.